I have been familiar with this novel all my life. Until a few weeks ago it lived on a bookshelf in Oldham next to The Girls of Gwynfa, Keeper of the Bees and Dimsie. They are part of a collection of Mum’s Sunday School prize books. 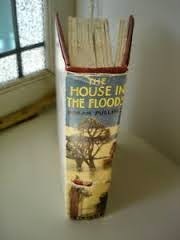 The House in the Floods is one of her favourite books. I hadn’t read it for at least thirty years but was drawn to it again as the storms and heavy rain hit Britain. The story is about three schoolgirls who get trapped in a flooded house on the River Thames. Joan, Rosemary and Dinah are left behind in quarantine when their boarding school breaks up for Christmas. At the last minute they are allowed home and are given telegrams to post to inform their parents. As a child reading this story I particularly loved the sections where they search the house and hunker down. The girls are brave and practical. They find a tin of cake and some apples in the attic and rescue a kitten from drowning. There are, of course, no adults. As an adult I found this section about children trying to define their world the most satisfying. They are joined by two other schoolgirls, Isobel and Anne (from the rival boarding school), and they have to decide who will be in charge and maintain order and they all learn to trust each other and become friends. Yesterday I looked again at the dedication and the date inside the book - 2nd January 1943. Mum was 10 years old at this point and living through a war when she first encountered and became so attached to this story. She had not been evacuated and was living in a part of Manchester that was being bombed. I began to see more clearly why this story might have been both a welcome escape into a world of controlled danger (the floods are never made to feel life threatening) and also to reflect the experience of food shortages, make-do-and-mend and the loss of homes and possessions. Does anyone have any information about the author, Norah Pulling? I would love to know more about her. I haven't heard of Norah Pulling, but what a name! Nor had I come across this book, but I recognise the type of book, and know that I would have loved it as a child.